Can you share the project please? 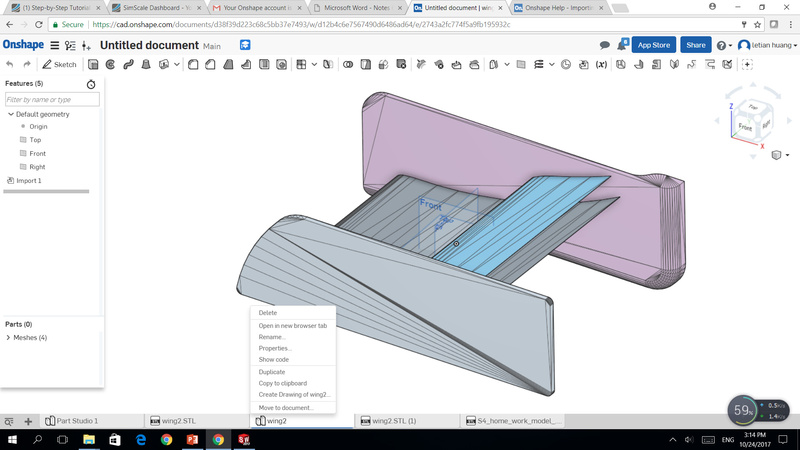 can you upload your wing to OnShape and see if exporting it from there works? Hope that you are even able to upload it on their platform and don’t get an error message. Try that approach and tell me if it worked. So - I set up the simulation parameters and set it to run. Will know more in a few hours, if it runs. Glad it worked out @dond! Keep me up-to-date. Interested in your results! I’ve read your reply that the deadline will be extended but still, just so you’re informed, the platform has been a bit slow today for some odd reason, my mesh took more than 2 hours to finish as it got stuck at 100% and wouldn’t let me use it on the simulation part. Not only that but the link to submit the homework seems to be broken (it doesn’t load after you press to submit). I can open the wing with OnShape but I don’t see the export option right clicking the tab. I think the car model given above is scaled differently than Front Wing. Length of the car is coming out to be 0.0632m. Since we are interested in reducing drag, which parameters should we look at in the results? I initially thought the viscous force was to be minimized, but that apparently is not the case. It is still running, hope to complete simulation later tonight. Simulation concluded - with results. Will post process tomorrow. Will have a look at it later on @DanyV! Export the wing as STEP or IGES from the cad software, upload it to onshape and from there export it as STL. @mislavbosnjak Can you explain him what you did in order to make it work? Having a look at it @aidrisova! Can you please answer @pankajkumar979 & @dond - @drodriguez32? Thanks for your interest in helping. However, I do not knw why, but I have managed to run the simulation now. Yesterday I was not able to select the mesh as the domain during the simulation setup process and today, just by opening the project again it would let me select it. Hopefully in 3 or 4 hours the simulation will be finished without any more issues! Good luck to all of you who have struggled like me! 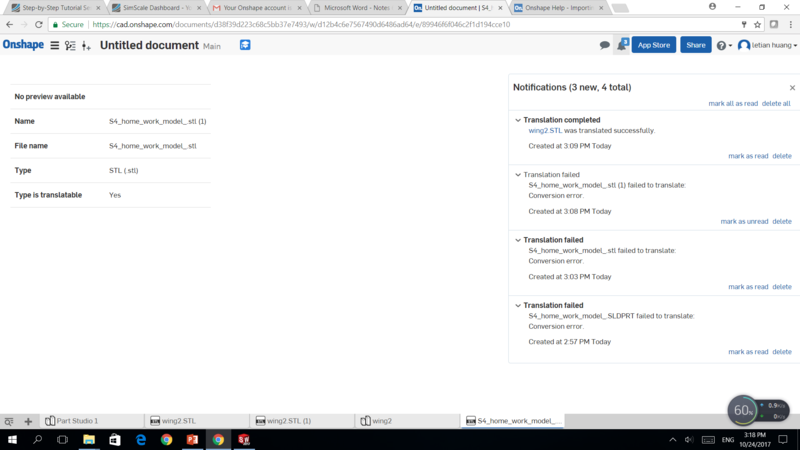 Is it possible to extend the deadline till today? I’ve tried to merg the two files but it is not working. I modified Front Wing and it fits perfectly with the standard front part of the car. Sorry to hear you’re having trouble with the car model. 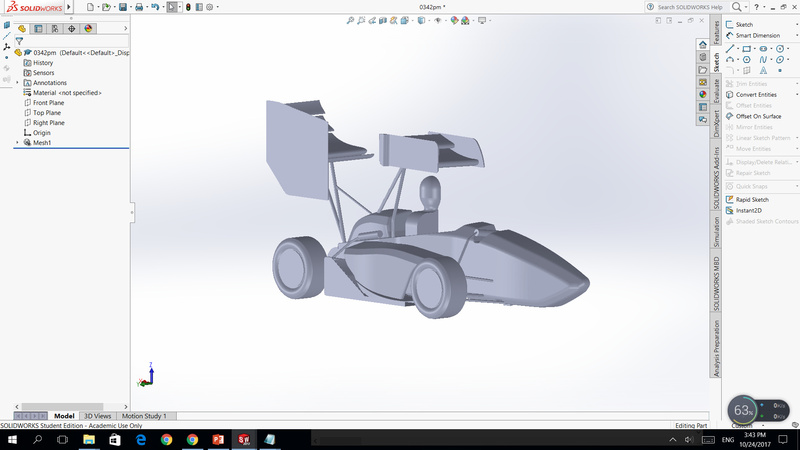 But I’ve gone through the workflow various times and this is not the case, the car is correctly scaled. It can be an import setting on your CAD software that scales it differently, you have to be careful with this. But the most important thing is that you always export the STL’s using meters or else they will not have the correct size in SimScale. This is the STL of the whole car that is provided at the beginning. It is not possbile to extend the deadline for one more day? The meshing was successfully completed when I checked during the afternoon. Have started the simulation, awaiting results now.